So you’ve got a list of e-mail addresses and you want to send out email campaigns to boost your ROI. Pretty justified! But sending out the same campaign to the entire list? Pretty vague! This is where segmentation bangs in, because an effective email marketing campaign is all about RELEVANCY i.e., sending the RELEVANT information to the right subscriber and of course at the right time. And if your content is not relevant to the subscriber, then get ready to be “unsubscribed”. There are broadly 4 ways in which you can segment your subscribers so that you can increase your response rates. And according to our research, Interest Based Preferences (69%) and Recent Open and Click Activity (50%) are the top segmentation techniques India Marketers plan to implement in 2017. If you are a national franchise or an e-commerce firm or for any other reason the location of your subscribers play a significant role in what they might be interested in, then you should segment your subscribers according to their location. By segmenting subscribers geographically, you can send email campaigns with content like discounts, coupons for a local holiday or can send invites for an upcoming local event. 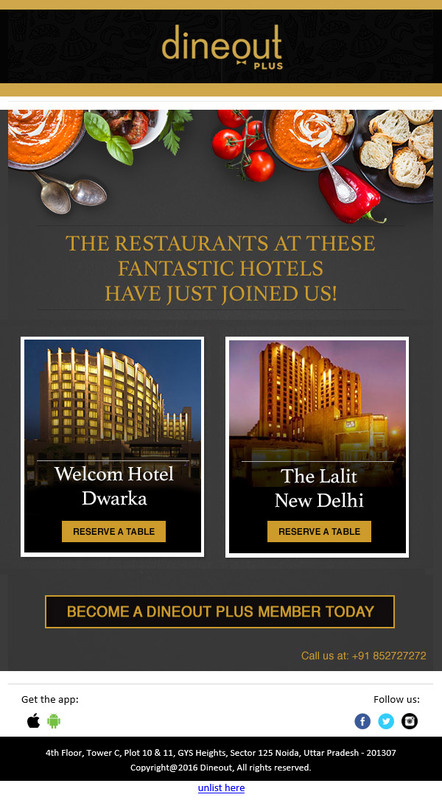 The above mailer from “dineout” is a perfect example of geographical segmentation. The most basic way to segment a company’s audience is through demographics that will include information like gender, age, income level, education qualification and job function. And the best way to ascertain all this information are signup forms, the more information you get in this plot more precisely you will be able to segment you subscribers. 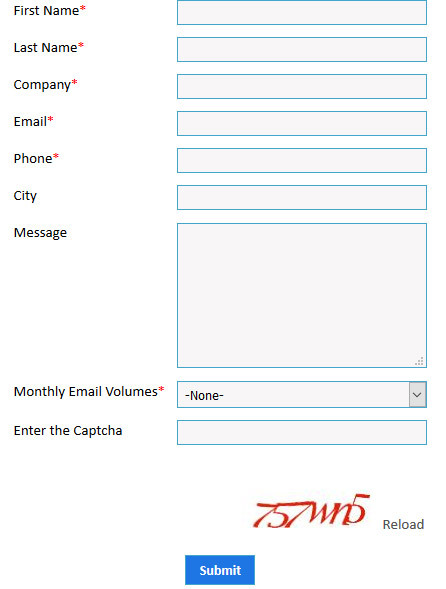 Now this is how you can compose your signup form. Psychographics are all about buyers’ persona, their lifestyle, and their attitude. Psychographic Segmentation is a rather advanced tactic, but if cracked with precision will serve you higher benefits. You can get detailed information about subscribers’ personal interests by creating user profiles on your website or using an email subscription center. With Behavioral Segmentation, you can dig deeper into the “when” and “what” of subscriber pool. It brings endless possibilities that boost every metric from open rates to conversion rates. Behavioral Segmentation includes sub-groups like interest based preferences, purchasing history, sales funnel, buying frequency and the response rates. You can segment your list based on how interested leads are in your content and then categorize them in the sales funnel. Someone at the top of the funnel should receive different emails than those at the bottom i.e., for a group of new subscribers you can send out more generalized email campaigns including the welcome emails. And for the existing subscribers you should aim for more personalized campaigns. Another very important aspect of behavioral segmentation is the response rates. Response rates will include your open rate, click-through-rate and the conversion rate. You can do A/B testing to know which campaign version works best for you. 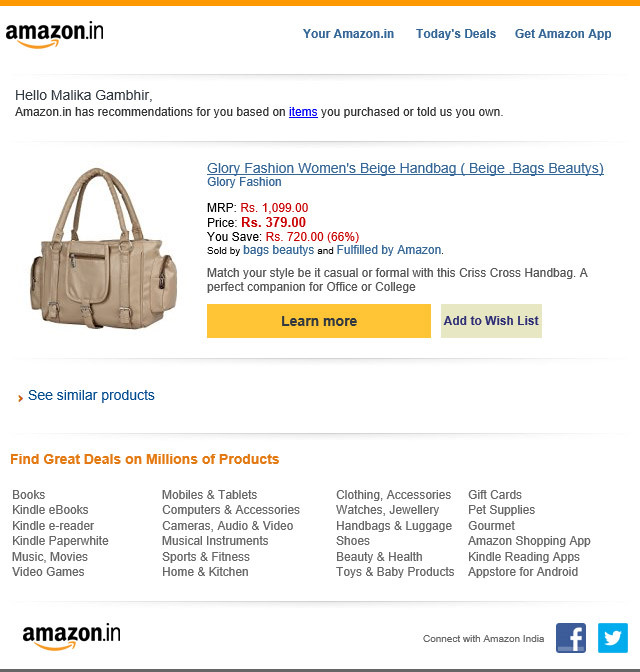 “Amazon” has very well crafted this mailer based on the purchase history of their customer. You should definitely try out the above techniques and split test them to see what works best for you. You can either segment your list using anyone of the above techniques or you can make a happy meal out of them! Malika is a Summer Intern for Octane and an MBA from IBS-Gurgaon. When she’s not thinking about marketing, you can find her thinking about good food and great music.